Performers showing their skill with the diabolo and stunts. ‘Ajat Simongi’, a vibrant display of ethnic costumes and culture. 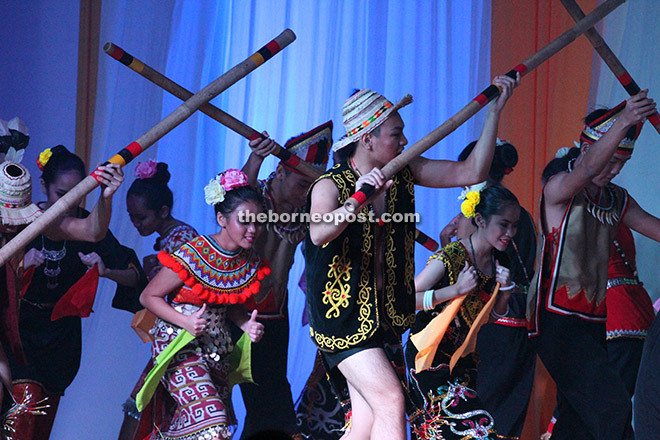 KUCHING: An audience of 800 was treated to an entertaining variety show by students of St Joseph’s Private School at the Grand Hall of the Archdiocesan Curia and Cathedral Pastoral Centre (ACCPC) here recently. The concert themed ‘Rhythm & Colour’ aimed to develop in students interest and appreciation of the performing arts. It was the school’s first ever variety show following the success of their production of Shakespeare’s ‘The Tempest’ last year. The collaboration of primary and secondary schools performed 18 diverse items in all. The opening act was a spirited performance by award-winning St Joseph’s School Marching Band which went down well with the audience. The band comprised musicians from SMK St Joseph and St Joseph’s Private School. This was followed by the Malaysian Medley by the primary school choir. The junior choristers, donning bright colourful scarves, delighted the crowd with Malaysian favourites such as ‘Dayung Sampan’, ‘Chan Mali Chan’, ‘Burung Kakak Tua’ and ‘Rasa Sayang’. Accompanying the choir was a small group of junior actors dressed in vibrant ethnic costumes who dramatised the songs while they were sung. Another entertaining item from the primary school was ‘Mirror, Mirror’ by aspiring stand-up comedians Andrea Wong and Yeo Zimoh, whose hilarious performance discussed the subject of mirrors and superstitions attached to them. There was certainly no shortage of talent from the secondary school. ‘Hush!’, hailed ‘Detention With a Difference’ by the emcees, combined elements of drama, ‘Stomp’ and beatboxing. A bunch of rebellious and wayward high school students turned up for detention class, and some of them begun beating rhythms on their tables, much to the annoyance of the others. Soon after, their teacher turns up, and unfazed, they continue their incongruous behaviour. To their surprise, he challenges them with his impressive beatboxing skills. Before long, the entire detention class is united in an uproarious Stomp-inspired performance. Needless to say, the audience was enraptured. Meanwhile, the Cultural Dance Troop enthralled with an item ‘Ajat Simongi’. Dressed in beautiful and elaborate ethnic Bidayuh, Iban, Orang Ulu and Melanau costumes, their performance incorporated elements of dance from each of the four main native ethnic groups of Sarawak, including the iconic bamboo dance. Other performances were choral speaking, diabolo and various types of music and dance items, all of which added a unique flavour to a night of great entertainment. The grand finale saw the St Joseph’s School Marching Band, St Joseph’s Private School String Ensemble, St Joseph’s Private Secondary School Choir and various other musicians come together to perform ‘The Circle of Life’ from Disney’s ‘The Lion King’ which received thunderous applause from the crowd. The curtain call which followed brought back not only the performers but also the technical, lighting, makeup and front-of-house crew. The two-and-a-half hour concert ended on a high note with a bang, confetti and coloured ribbons. “I am happy to see various kinds of talents in our students,” said Fr Francis Lim SJ, principal of St Joseph’s Private Secondary School. The students have worked hard to put their best foot forward. For the last three months, they sacrificed their afternoons, Saturdays and even public holidays to practise. The staff of St Joseph’s Private School were no less dedicated, most of them involved in one way or another. “It was a wonderful performance. I express sincere gratitude to all those involved, especially the parents who have been very supportive,” said director Mr Gerald Lee. Present were Archbishop Datuk John Ha, Auxiliary Bishop Simon Poh, chairman of the board of directors, Tan Sri Datuk Amar Leo Moggie as well as other members of the board.